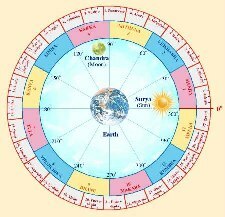 Chitra Nakshatra: Spread from 23:20' Kanya to 6:40' Tula Rashi. The lords are Budha and Sukra, Deity Viswakarma, the symbol is the gem on the serpent's crest. Chitra is very beautiful to look at. Viswakarma, the great artist and artificer to the Gods, the lord of practical arts and applied aesthetics. He is extremely intelligent and peace loving. He will not hesitate to go to any extreme for the sake of selfish benefits. There is an innate and hidden inherent gift for this Nakshatra born i.e., the ideas or opinions or advice expressed by him would initially appear to be a sheer nonsense, but later on the same idea or opinion or advice will only prevail. There is also an inborn gift of intuition. Hence, he is a type of person who is very much fit for the Astrological profession where intuition is very much needed. In some cases, it is also noticed that the native quite often dreams a lot which eventually turn out true. This indirectly indicates that the brain of Chitra born is naturally blessed with a divine power. He is the type of person who is neither bothered about the sentiments of others nor is he selfish to others. But in spite of this adamant attitude his dealings with the poorer section of the society will be very cordial and full of kindness. Quite often he is mistaken by others for being very rude and stingy. He has a tendency of replying back on any matter without forethought and he wakes up at the eleventh hour trying to rectify his utterances, when it is far too late. He has to confront his enemies at every step, but he is capable of escaping any conspiracy. He has a soft corner for the down trodden people and he devotes his time and energy for uplifting this section of the society. But one of the hidden factors is that initially his approach to the down trodden will be without any selfish motive, which later on culminates into a selfish one. It's true about chitra female..married life..